The Aveiro Cardigan pdf pattern from Kennis Wong at Itch to Stitch patterns was a much needed item in my wardrobe. It was also a huge milestone for Kennis, as this is her 50th pattern that she has released since opening shop 4 years ago! I love a pattern with options and this one really fits the bill. With four different lengths and four different sleeve options, if my math is correct, that gives a total of 16 different variations! I made the regular length with 3/4 sleeves in a knit I had in my stash. It is a type of a double knit and I choose this because it is really soft and warm…and the days have been quite cold so this is very welcome. It was freezing the day we did pictures which is why we only got a few of them and then I grabbed my winter coat and hopped in the truck! All of Itch to Stitch’s patterns are named after a beautiful city or area and this one is no different. Aveiro, which I believe is pronounced ‘A-vair-ro’, is a city/district in Portugal and is known as the Venice of Portugal. 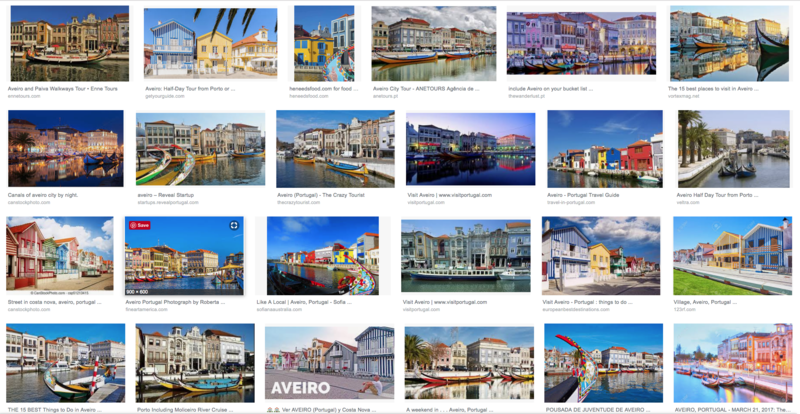 I searched for some images of the Aveiro district and I think I actually picked an appropriate colour for my Aveiro Cardigan. Look at these gorgeous colours on this screenshot from this Google image search! The Aveiro Cardigan has so many possibilities, I know that there will be more in my future. I love the 3/4 sleeves for everyday wear and the long length with long sleeves will be a great layer over dresses or leggings. And when the weather gets warm again, the bolero will be the perfect addition to keep my shoulders warm in the cool evenings. I also know that I will be making this one in a sleeveless version because this is a perfect base for a vest! The Aveiro Cardigan pattern is available this week at the new release discount of 20% off the regular price but ITS usually has a discount available when you buy more than one pattern(even patterns on sale) and with 50 patterns available, it won’t be difficult to find more that you will want to add to your cart! Your Aveiro is lovely and enjoyed learning more about the beautiful city it is named for!